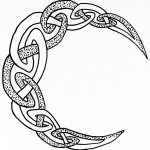 My Celtic ancestors held huge celebrations today in honor of the abundance and fertility of the growing season. The time to plant has just begun here in the northern hemisphere and Beltane honors that fact. Last night under the dark of an earthy Taurus new moon, we slid quietly into the light half of the Celtic year. The light half of each year is filled with sun and warmth, new growth and abundance. And then in 6 months, on November 1, we will dive into the dark half of the Celtic year, marked by short, dark days, fallow ground and long cold nights. And so the cycle of the seasons progresses, year after year after year. The Celts were avid observers of the seasonal shifts, both on Mama Earth and in the skies above her. So it doesn’t surprise me that my Welsh and Scottish ancestors held outdoor festivals to mark Beltane, also known as May Day. The tradition of teen aged boys and girls dancing around the May pole is believed to have started with the Celts. The dance was a way to have fun AND symbolize the intertwining and merging of the male and female energies that ultimately creates new life on the land and in the waters all around us. 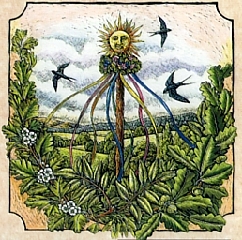 Beltane marks the beginning of Mama Earth’s season of fertility and new growth. For me, Beltane is all about celebrating intimate relationships. My own anniversary falls on May Day, so I consciously celebrate my union with my partner David on this day. But Beltane has other meanings for me as well; my hubby would tell you that this is my absolute favorite time of year, and I love to spend it outside in nature. I love to get outside and commune with Mother Nature by hiking, dreaming in my hammock, picnicking, or just sitting with a tree listening to the wind rustle a million new leaves above me. And I find that every moment I spend connecting with nature nourishes my Soul. Beltane is the perfect time to connect with Mama Earth in a deep intimate way. If you can, spend a few moments outside this week. Turn off your computer and go walk barefoot in the grass. Breathe in the scents of spring. Pause and notice the abundance of new life sprouting up all around you; green shoots of grass, tiny new tree leaves and a plethora of flowers all show us how fertile and abundant Mama Earth is at this time of year. Meditate on the beauty and bounty of Mama Earth. Give thanks for every gift that this beautiful planet joyfully shares with us. Give thanks and revel in spring. Share the post "Happy Beltane"
Spam free. I will never share, sell, rent, or give your email to anyone for any reason.